Keeping up a consistent workout routine can be tough, especially in today’s fast-paced world. As a busy working woman and mom, I know how hard it can be. Here are some of the tips and tricks I use to make sure my fitness routine doesn’t fall through the cracks. Turn off the late-night TV. Sometimes it’s easy to get sucked into a mindless activity, and before you know it, it’s past your bedtime. So turn it off and get the sleep you need so you feel refreshed and ready for a morning workout! Commit to a time of exercise you know that works for you. For many clients, that’s first thing in the morning. People who adopt this practice as part of their daily routines may be more likely to stick with it. Also, after a long day of work, it can be difficult to take on another task or challenge. For the best results, get up and go! Having said this, there are always exceptions to this rule – personally, I work out at all times of the day –whenever I can fit it in. I just make sure not to miss it! Struggling with making the commitment -learn how to make an exercise routine happen. Break it up. Sometimes it’s difficult to fit a full workout into the day. It can be much easier to commit to simply doing 15 minutes in the morning and then 15 minutes at lunch or in the evening. I’ll often work in 30 minutes of legs and core in the morning and then follow up with 30 minutes of cardio at night. See where you can shave time off your schedule to preserve some energy and time to work out. Maybe you tend to talk on the phone or surf the net for a little too long. 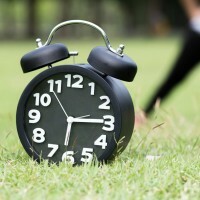 Put a time limit on the activities that are sucking you in (set an alarm to stick to it), and use that extra energy and those precious minutes for some exercise. Increase the resistance. On a day when you really don’t have much time, make the workout more efficient by increasing the intensity of your cardio machine to a higher level, but always remember to monitor your heart rate. You could also combine leg and arm muscle group exercises for a full body workout or try high intensity interval training (HIIT) (1). By using these tried and true tricks, you’ll be amazed at how much time you can discover in your day. Fill those extra minutes with exercise to stay healthy and energized. See 20 plus fitness tips to get moving everyday for more ways to be naturally active. (1) https://www.ncbi.nlm.nih.gov/pubmed/22289907 Gibala MJ, Little JP, Macdonald MJ, Hawley JA. Physiological adaptations to low-volume, high-intensity interval training in health and disease. J Physiol (Lond). 2012;590(Pt 5):1077-84.